“He is a genius with a childlike heart, a man who leaves a lasting imprint on people as well as on canvas,” Mary Whalen Leonard told the Post in 1976. We spoke with her again recently to ask about one of Norman Rockwell’s most respected paintings—and about the artist himself. 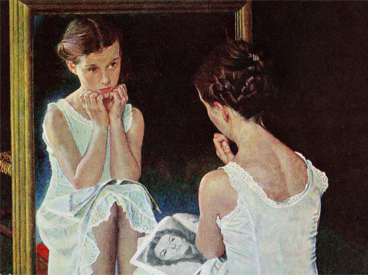 Mary’s pose seems “apprehensive, as if she understands that womanhood is upon her and fears that she is not quite ready,” writes art expert Karal Ann Marling in her 1997 book, Norman Rockwell. However, young Mary didn’t have a clue. “I was only in fifth or in sixth grade, and I wasn’t a kid who was at all interested in growing up. I was just having a good time,” Mary says. In what would become one of his most respected paintings, Rockwell captured the poignancy and uncertainty of growing up despite the fact that Mary “had no idea what he was talking about.” For decades critics had dismissed Rockwell as simply a popular commercial illustrator. Today, many have concluded that some of his works, however, transcend freckle-faced boys at the ole swimmin’ hole and secure his standing today as a true artist. Girl at the Mirror is such a painting. See Mary today as she talks about the artist in this video, courtesy of the Norman Rockwell Museum.